Arlington County has launched the first phase of Arlington Wallet, a new online tool that makes it easier to see and understand how the County spends and receives money. County Manager Mark Schwartz announced the launch at the County Board’s Jan. 29 Recessed Meeting. Arlington Wallet makes detailed County financial information available in an easy-to-navigate online interface that anyone with an internet connection can access anytime. Users can view data in interactive, visually attractive charts and graphs; drill down and filter data by department, expense type, fiscal year and more; and explore data at either an annual or monthly level. The tool also allows users to download high-resolution versions of the charts and graphs they create or any of the available raw data. 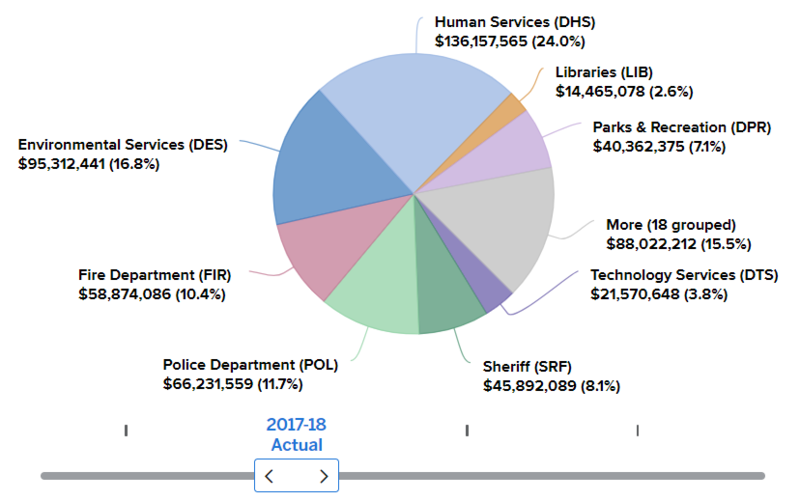 For now, Arlington Wallet provides data on budgeted and actual spending and revenue going back to the County’s 2014 fiscal year. A second phase, planned for later in 2019, will include data on individual County transactions — essentially, what the County is buying and who it’s buying it from, like a personal checkbook or online account statement. Arlington Wallet furthers the County’s commitment to ethical, transparent government and fiscal responsibility. “This new tool brings a level of transparency that our residents and businesses both deserve and expect,” said Maria Meredith, the County’s Management and Finance director. Arlington Wallet runs on the third-party OpenGov platform, which is used by more than 1,600 other governments and government agencies across the United States. Arlington’s Open Data Advisory Group and Fiscal Affairs Advisory Commission provided valuable feedback and support in developing the new tool.